American fashion stylist, TV personality and entrepreneur, Rachel Zoe, once famously said, “Style is a way to say who you are without having to speak”, and we couldn’t agree more. Whether it’s your first day at a new job or if you’ve been there for a while, and whether it’s a fashion firm or an engineering company, how you present yourself is how people are going to perceive you — especially your bosses. So if you’re looking to stand out, either for an upcoming promotion or to refresh your look, here are our top 10 tips on dressing to impress your boss. Take style cues from the way your boss dresses. Are they decked out in luxury brands from head to toe or do they mix and match with high street labels? Do they follow the latest trends or have a distinct personal style? If your boss is a woman, does she wear a lot of makeup? And if it’s a man, is he dapper and dandy? These are important questions to ask yourself and the answers are right in front of you — so pay close attention as it tells you what style your boss appreciates. Emulate their style in a way that’s still representative of who you are with your own personal flair. And they’ll slowly, but surely, start to notice you more because of it. The term ‘grooming’ is often used exclusively for males but we think it’s just as important for women, especially if you’re looking to leave a mark on your boss. First things first, keep your hair neat and tidy. If you find it hard to maintain long tresses, opt for a lob (long-bob), as seen on the likes of Nina Dobrev and Cate Blanchett. It’s chic, sophisticated and frames the face. As for makeup, we believe in less is more. Pay more attention to skincare and over time, you’ll realise you actually don’t need a lot of cosmetics to shine. Using light layers of makeup, with complementary colours on eyes, lips and cheek, will help you look like your best self. And lastly, pay attention to the state of your nails. Not only are long and dirty nails unsightly, they’re unhealthy. So take a trip to your favourite nail salon and #treatyourself to a mani-pedi — you’ll get to relax, have beautiful nails and impress your boss with your tiptop grooming standards. Shopping at luxury labels isn’t for everyone, and it definitely isn’t quintessential to looking your best. What does elevate your style game, is the right fit. When out shopping, don’t get disheartened when a fabulous piece doesn’t fit right. Simply take it to a seamstress and get it altered to fit you. This shouldn’t set you back more than $10, depending on the extent of alterations. And most stores these days offer complimentary in-house alterations. You can also apply this trick to any existing pieces in your wardrobe. Wearing clothes that fit your body right demonstrates attention to detail, self-respect and an understanding of clothing that’s often overlooked, which gives you a competitive edge. Looking sloppy in oversized and unflattering pieces does not. On Monday morning — or every morning till the weekend — deciding on what to wear is a struggle we can all relate to. Often times, we let our laziness (or one too many night caps) get the best of us and end up wearing something casual or comfortable. And guess what? Your boss and peers will be able to tell. To combat that, plan your outfits a week in advance so all of you have to do in the morning is put them on. There are apps for that too. #Protip: Always dress more formal than you think you should, it’ll never fail you. Pink power suit with sneakers on a Wednesday. Marilyn Monroe was once famously quoted saying, “Give a girl the right pair of shoes, and she can conquer the world”. True story. Paying attention to what’s on your feet are just as important as everything else. For starters, toss out all of your shoes showing obvious and irreparable signs of wear and tear. Next, look for sleek and classic designs when shopping for new ones. Invest in premium quality shoes so you can get more wear out of them. We recommend a nice pair of heels (preferably closed toed) and chic ballet flats. But if you’re like Kristen Stewart and love wearing trainers with your dresses, invest in a good sneaker cleaner, especially if you like wearing white shoes. Dirty shoes are, and never will be, in trend. One surefire way to kiss goodbye to that promotion you’ve been eyeing is to turn up to work in wrinkled clothes. There’s absolutely no excuse for wearing crumpled clothing to work — it suggests a lack of decorum. If ironing isn’t your thing, invest in a steamer; it’s a quicker and easier alternative. For quick on-the-go fixes, get a bottle of wrinkle release spray and better yet, keep one at your desk. From the iconic Chanel No. 5 to the effervescent Miss Dior by Dior, fragrance are just as much a part of dress as everything else. We strongly suggest investing in a scent, because not only will it last throughout the day, you’ll require less spritz and and the scent won’t change over time. #Protip: Don’t buy the perfume you see everyone buzzing about on social media. Instead, search for unique scents at places like Jo Malone or Le Labo. And don’t limit yourself to women’s fragrances, try men’s — it’s something both men and women are attracted to. This way people (and your boss) will start to associate that scent with you, therefore taking better notice of you. An important thing to note: Apply it sparingly so people don’t tire of it. Apply it slightly further away from your wrist area (so it doesn’t disappear when you wash your hands), dab it with your other wrist — don’t rub it as that’ll change the notes of the perfume — and finally, dab it on either sides of your neck. If you're still unsure, you can always check out our intensive guide on perfumes. Approach dress with this quote from Coco Chanel: “Fashion fades, only style remains.” Developing your own personal style as opposed to coping the latest trends, is a great way to set yourself apart from your colleagues. That said, there are ways to incorporate it into your style. During her press tour for her book, Becoming, former United States first-lady, Michelle Obama, wore a pair of gold thigh-high boots from Demna Gvasalia’s Balenciaga SS19 collection and paired it with an elegant canary yellow silk dress — and that ladies and gentlemen, is how you execute the latest trend with personal flair. Take notes. Knowing how to edit what you bring with you in your bag, demonstrates the ability to plan, prioritise and anticipate needs — valuable qualities any boss would look for when deciding on a promotion. Reserve your tote bags for the weekend and swap it out for more elegant, sophisticated and structured options like the Sac De Jour small croc-effect leather tote from Saint Laurent. 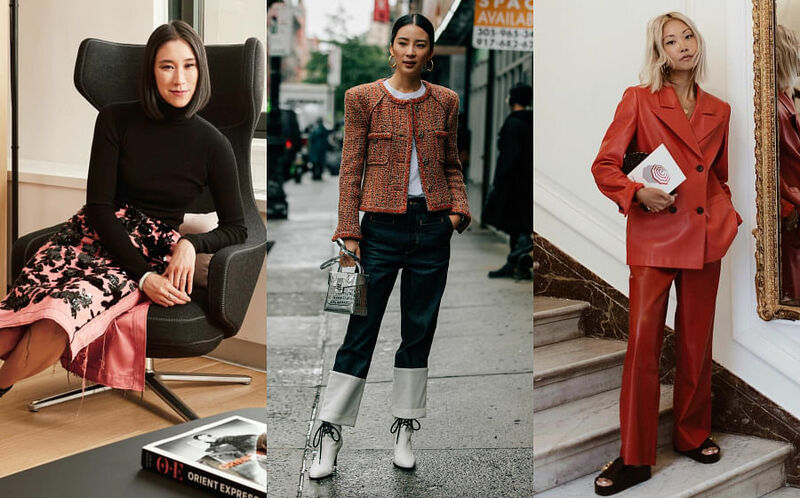 Blazers are often associated with boring, masculine silhouettes reserved for executives or hedge fund managers, but it’s actually fast-becoming a staple in many fashion editors’ and fashion enthusiasts’ wardrobe and for good reason. It can take an outfit from zero to a 100, and can be worn with jeans, a skirt and even over a party frock. It’s an incredibly versatile piece, and successfully mastering the various ways to wear it will definitely impress your boss.